9th in the National Indoor Tournament. 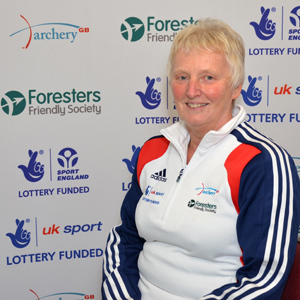 Pauline has already attended two Compound Squad weekends at Lilleshall which involved shooting many arrows at 50 metres, learning and practising how to take part in both Ladies and Mixed Team matches. Following these squads she has accepted an invitation to form part of a GB team going to the June European Grand Prix event in Cyprus. Her physical training regime involves early morning alternate gym and swimming sessions and regular outdoor shooting practise. Being a GB representation comes at a price, the trip to Cyprus is self-funding so on top of the cost of the Entry Fee, Accommodation and Flights there is also a small matter of obtaining the additional archery equipment needed to sustain shooting for 6 days at International events.